I am a builder by trade and made the transition to the restaurant industry slowly. I began with small catering jobs for family and friends and volunteered with Peter Meier at his respected Casuarina Restaurant in Pokolbin. With each function the challenges grew and so did the enjoyment. The natural progression was to have my own restaurant and so we opened Henri’s Brasserie in Singleton eight years ago. It has had many positive influences over this time with some great chefs helping us out and fantastic customers who return regularly. I am actually a builder by trade, with a passion for picking up an ingredient and working with it to discover ways to enhance it with flavour, texture and presentation. 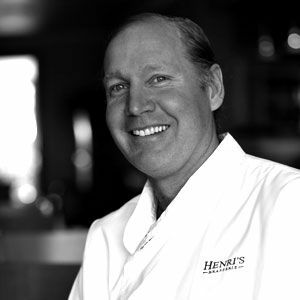 10 years ago I took the plunge and built Henri’s, then made the career move to focus on 'building on the plate’. I haven’t really looked back since. I draw predominantly on French influences but with contemporary Australian style. Consistency. Our guests must always have a brilliant Henri’s experience! Never anything less. I love desserts and pastry. Michel Roux and Stephane Glacier are favourites when looking for inspiration. I love the buzz of building a dish with balance in flavour, textures and presentation and then seeing our guests enjoy it. It certainly makes it all worthwhile. Chocolate. The options are endless (as is the line of tasting volunteers!). Most “eyebrow raising” menu item? Cuba dark chocolate tower filled with freshly churned lemongrass ice cream.